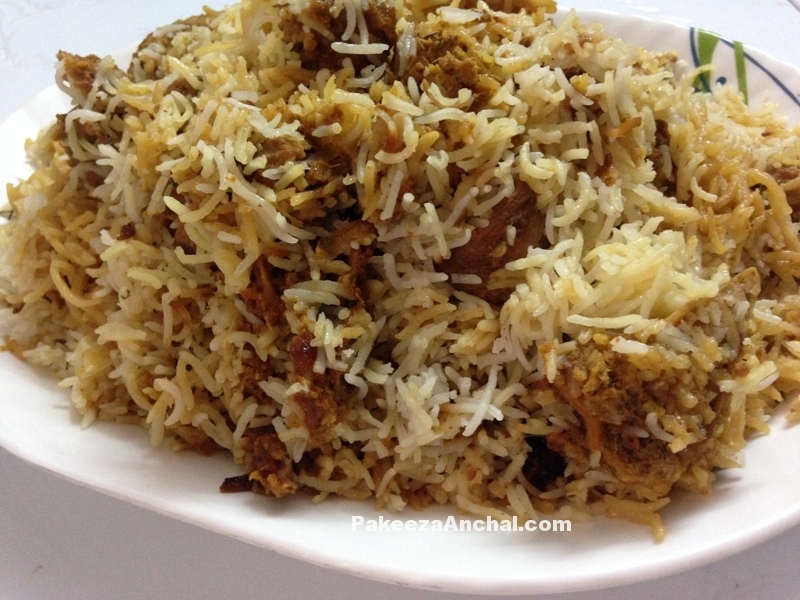 Find and discover how to make tempting and finger licking Mutton recipes for Bakrid. 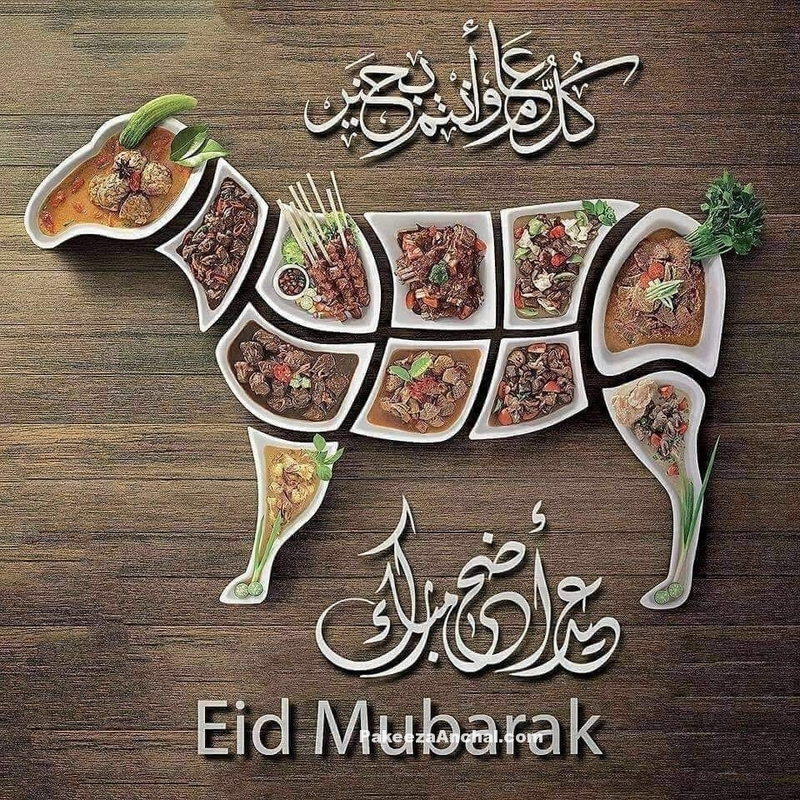 With Bakrid which is known as the festival of sacrifice and celebrated by Muslim all around the world, PakeezaAnchal.com provides Top Bakrid Mutton Recipes that can be made on Eid-uz-Zuha Eid. Bakrid Mutton Dishes at PakeezaAnchal gives you a perfect idea about lots of delicious mouth watering recipes, finger licking mutton recipes on the Eid day. In a large bowl ,Add the Mutton marinate with meat tenderizer, yoghurt ginger garlic paste, Red chilli powder, Turmeric powder, Garam Masala powder, Saffron, Lemon, Fried Onions, Green Chillies, Coriander (finely Chopped), Mint ,Salt to taste and oil mix well. Wash the rice and soak it in surplus water for about 1/2 hour. In a large saucepan at medium heat, add 2 cup oil. Add onions and fry to golden brown,take out few fry onions(these are used for garnishing). Meanwhile, In a large cooking pot pour in water along with cloves, cardamom, cinnamon, caraway seeds and salt. let it come to a boil,add the drained rice Give it a stir and let the rice cook until it is half done, 2-3 minutes. Drain the rice. Then Spread the drained half cooked rice over. Spread evenly the chopped coriander, mint, fried onions,Toasted sliced Almonds, yellow colour &Ghee. Then Cover the vessel properly with aluminium foil or cover with cotton cloth or seal with wheat dough,then place a heavy weight over the lid ,so that no steams can escape so the nice steam can formed inside. Place the Biryani vessel on the iron Tawa and cook on low flame. Allow to cook in very low heat for 1 1/2 hours, close the heat, but leave the saucepan on the hot stove so that a nice steam forms. Let the dish rest for 15-30 minutes. Clean and marinate mutton with half of ground paste of ginger, garlic, green chillies and salt for 1 hour. Pressure cook the soaked wheat and marinated meat for about 45 minutes. Mince and grind to a fine paste. 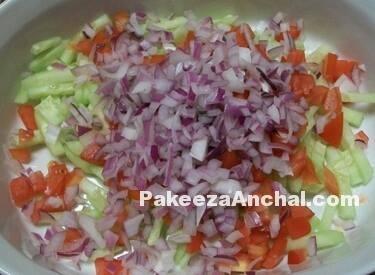 In a Pan heat oil, add the finely sliced onions, fry till brown, add the garam masala. Add the ground paste and keep stirring on slow flame, till the mixture leaves the sides of the pan. Grind ginger, garlic and papaya to make a paste. Mix ginger garlic paste, papaya paste, white pepper, roasted coriander and red chilli powder. Marinate the mutton in this mixture for a night. Heat the oil and fry chopped onions till they turn golden brown. Add marinated mutton and water. Put it over the heat till it gets cooked. Adorn with fresh coriander leaves. 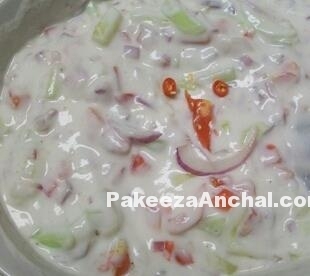 Hyderabadi Delicacy, SheerKhurma Recipe – Eid Special! 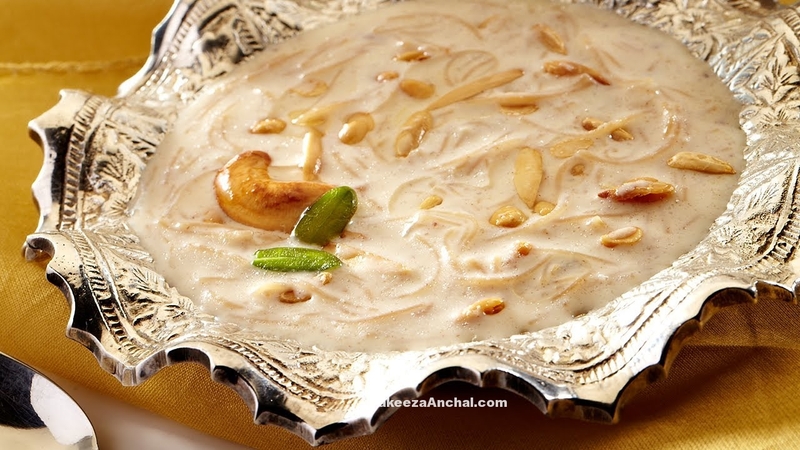 Hyderabadi Delicacy, Sheer Khurma – Eid Special! Fry these dry fruits until golden for about 3 minutes. In a large non-stick saucepan/Khadhai , Fry the Crushed Sewaiyya into the ghee for 5-10 minutes till golden brown at medium heat. Allow to cook for 45 minutes till the milk reduced to three fourth its Volume. Then Add the sugar and stir till it dissolves, and add the Sewaiyya and dry dates . Allow the mixture to cook for 15 – 20 minutes on medium flame. Garnish with roasted and Sliced Almonds, Pistas & Sunflower seeds. Add in salt, red chili powder, ginger garlic paste, chili flakes, lemon juice, cumin, black pepper, sesame seed, green chili and coriander leaves and mix well. Then refrigerate this mixture for 15 – 20 minutes. 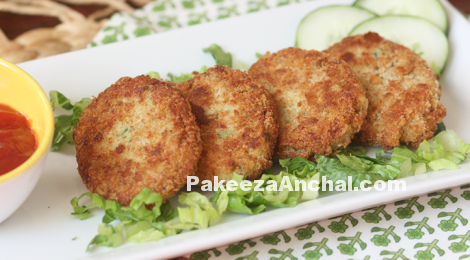 Now make small cutlets of potato mixture and dip in lightly beat egg. Fry the potato cutlets in a frying pan on medium flame till golden brown. Potato cutlets are ready to serve. Hope you guys enjoyed our Recipes. Please Follow us on Facebook and let us know, how our recipe tastes. Cut fish into circular shape pieces. Then marinate the fish pieces with vinegar, salt to taste, crushed black pepper and red chili powder. Coat the fish pieces with corn flour, dip in beaten egg and then coat with breadcrumbs pressing gently. Now deep fry the fish pieces till golden and take out on absorbent paper. Cut the buns in half, spread mayonnaise and mustard paste on them. 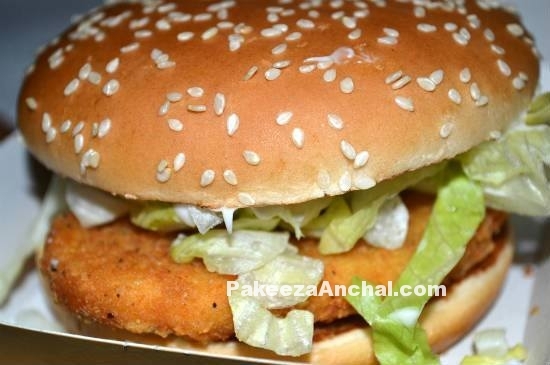 Top with ice-berg or lettuce leaves then top with fish piece. Put breast fillets in a bowl add lemon juice and salt marinate for 1-1/2 hour. For Steam: In a pan put 2-3 tbsp water put marinated chicken fillets in it cover and cook on lower heat for about 20 minutes. For Coating: Mix flour, salt, paprika, ajinomoto, mustard powder, white pepper, cinnamom powder and bread crumbs in a bowl. In another bowl beat eggs add a bit of milk and a pinch of salt. Take steamed chicken fillets, dip in egg then roll in flour. Again dip in egg and then in flour. Rinse, peel and grate the carrots with a hand held grater or in a food processor. Heat ghee in a kadai or thick bottomed deep pan. add the grated carrots. Saute the carrots till they turn tender and are cooked. keep on stirring in intervals while sauting the carrots. Then add the condensed milk. Stir very well and add the cardamom powder, cashews and raisins. Stir again and simmer the halwa on a low flame stirring often, till the mixture dries up and reduces. Taste if required, you can add some sugar. i did not add any sugar as the taste was perfect for us. 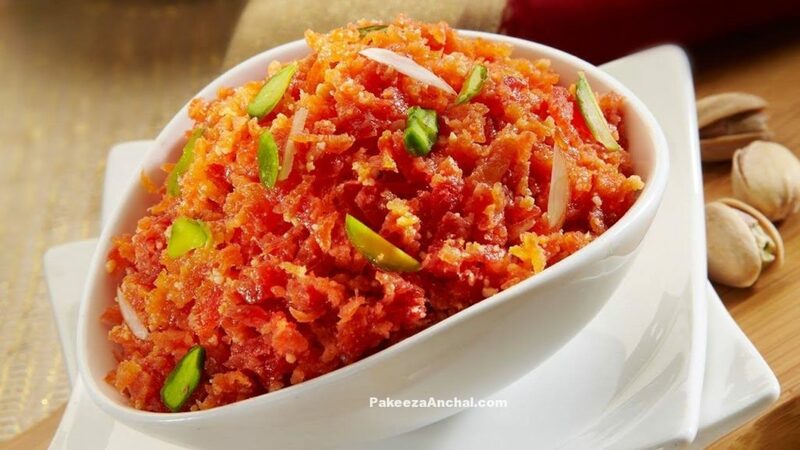 Serve gajar halwa hot or warm or chilled. Hope you guys enjoyed our Recipes. Please Follow us on Facebook and let us know your feedback. Combine ingredients in a bowl. Mix well and adjust and add spice levels to your liking. Chill in the fridge until ready to serve. Hope you guys enjoyed our Recipes. Please Follow us on Facebook and let us know, how our recipes tastes.